At the age of 23, if anyone was smiling just before he was being hanged to death, it was Shaheed Bhagat Singh. He was born September 27, 1907 in the village Banga of Layalpur to Mata Vidyavati and Sardar Kishan Singh. His uncle, Sardar Ajit Singh, as well as his father, were great freedom fighters, so Bhagat Singh grew up in a patriotic atmosphere. Ajit Singh established the Indian Patriots' Association, along with Syed Haidar Raza, to organize the peasants against the Chenab Canal Colony Bill. He also established the secret organization, the Bharat Mata Society. At an early age, Bhagat Singh started dreaming of uprooting the British empire. Never afraid of fighting during his childhood, he thought of "growing guns in the fields," so that he could fight against the British. The Ghadar Movement left a deep imprint on his mind. Kartar Sing Sarabha, hanged at the age of 19, became his hero. The massacre at Jallianwala Bagh on April 13, 1919 drove him to go to Amritsar, where he kissed the earth sanctified by the martyrs' blood and brought back home a little of the soaked soil. He studied in the D.A.V. School in Lahore. At the age of 16, he used to wonder why so many Indians could not drive away these fistful of invaders. In search of revolutionary groups and ideas, he met Sukhdev and Rajguru. 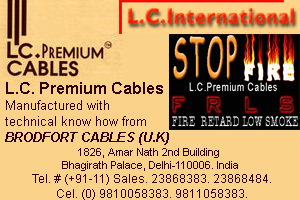 Bhagat Singh, along with the help of Chandrashekhar Azad, formed the Hindustan Socialist Republican Army (HSRA). The aim of this Indian revolutionary movement was now defined as not only to make India independent, but also to create "a socialist India." During the Simon Commission, Sher-e-Punjab Lala Lajpat Rai was wounded and died later. 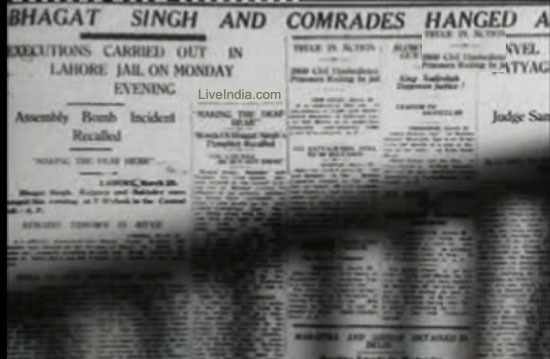 To avenge his death, Bhagat Singh and Rajguru killed Mr. Saunders (one of the deputy officers in connection with the Simon Commission). When the British government promulgated the two bills "Trade Union Dispute Bill" and "Public Safety Bill" which Bhagat Singh and his party thought were Black Laws aimed at curbing citizens' freedom and civil liberties, they decided to oppose these bills by throwing a bomb in the Central Assembly Hall (which is now Lok Sabha). 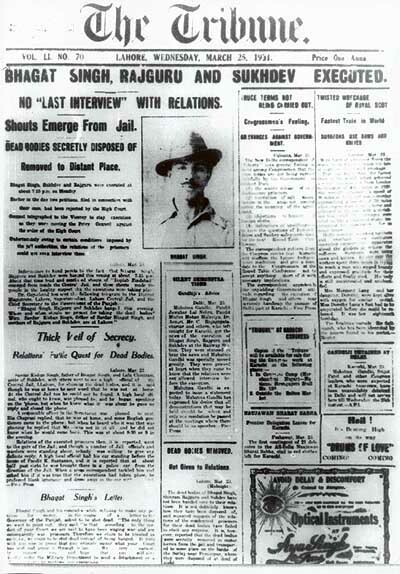 However, things changed, and the Britishers arrested Bhagat Singh and his friends on April 8, 1929. He and his friends wanted to be shot dead, since they were termed as prisoners of war. Their request was not fulfilled, and on March 23, 1931, Bhagat Singh, Shivram Rajguru, and Sukhdev were hanged to death. This man's only mission in life was to see his country free from British rule. He did his best and when he was being led to the gallows, he was satisfied that he had lived up to his principles, irrespective of the consequences. The only thing that made him sad was that he couldn't do more for his country. Bhagat Singh, September 27, 1907 – March 23, 1931) was an Indian freedom fighter, considered to be one of the most influential revolutionaries of the Indian independence movement. He is often referred to as Shaheed Bhagat Singh (the word shaheed means "martyr"). Bhagat Singh was born into a Jatt Sandhu family to Sardar Kishan Singh Sandhu and Vidyavati in the Khatkar Kalan village near Banga in the Lyallpur district of Punjab. Singh's given name of Bhagat means "devotee". He came from a patriotic Sikh family, some of whom had participated in movements supporting the independence of India and others who had served in Maharaja Ranjit Singh's army. His grandfather, Arjun Singh, was a follower of Swami Dayananda Saraswati's Hindu reformist movement, Arya Samaj, which would carry a heavy influence on Singh. His uncles, Ajit Singh and Swaran Singh, as well as his father were members of the Ghadar Party, led by Kartar Singh Sarabha Grewal and Har Dayal. Ajit Singh was forced to flee to Persia because of pending cases against him while Swaran Singh was hanged on December 19, 1927 for his involvement in the Kakori train robbery of 1925. Unlike many Sikhs his age, Singh did not attend Khalsa High School in Lahore, because his grandfather did not approve of the school officials' loyalism to the British authorities. Instead, his father enrolled him in Dayanand Anglo Vedic High School, an Arya Samajist school. At age 13, Singh began to follow Mahatma Gandhi's Non-Cooperation Movement. At this point he had openly defied the British and had followed Gandhi's wishes by burning his government-school books and any British-imported clothing. Following Gandhi's withdrawal of the movement after the violent murders of policemen by villagers from Chauri Chaura, Uttar Pradesh, Singh, disgruntled with Gandhi's nonviolence action, joined the Young Revolutionary Movement and began advocating a violent movement against the British. In 1923, Bhagat famously won an essay competition set by the Punjab Hindi Sahitya Sammelan. This grabbed the attention of members of the Punjab Hindi Sahitya Sammelan including its General Secretary Professor Bhim Sen Vidyalankar. At this age, he quoted famous Punjabi literature and discussed the Problems of the Punjab. He read a lot of poetry and literature which was written by Punjabi writers and his favourite poet was Allama Iqbal from Sialkot. In his teenage years, Bhagat Singh started studying at the National College in Lahore, but ran away from home to escape early marriage, and became a member of the organization Naujawan Bharat Sabha ("Youth Society of India"). In the Naujawan Bharat Sabha, Singh and his fellow revolutionaries grew popular amongst the youth. He also joined the Hindustan Republican Association at the request of Professor Vidyalankar, which was then headed by Ram Prasad Bismil and Ashfaqulla Khan. It is believed that he had knowledge of the Kakori train robbery. 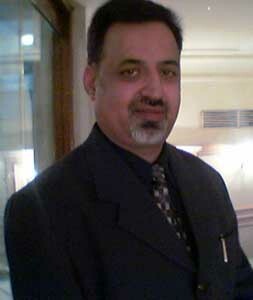 He wrote for and edited Urdu and Punjabi newspapers published from Amritsar. In September 1928, a meeting of various revolutionaries from across India was called at Delhi under the banner of the Kirti Kissan Party. Bhagat Singh was the secretary of the meet. His later revolutionary activities were carried out as a leader of this association. The capture and hanging of the main HRA Leaders also allowed him to be quickly promoted to higher ranks in the party, along with his fellow revolutionary Sukhdev Thapar. In the face of actions by the revolutionaries, the British government enacted the Defence of India Act to give more power to the police. The purpose of the Act was to combat revolutionaries like Bhagat Singh. The Act was defeated in the council by one vote. However, the Act was then passed under the ordinance that claimed that it was in the best interest of the public. In response to this act, the Hindustan Socialist Republican Association planned to explode a bomb in the Central Legislative Assembly where the ordinance was going to be passed. Originally, Chandrashekhar Azad, another prominent leader of the revolutionary movement attempted to stop Bhagat Singh from carrying out the bombing. However, the remainder of the party forced him to succumb to Singh's wishes. 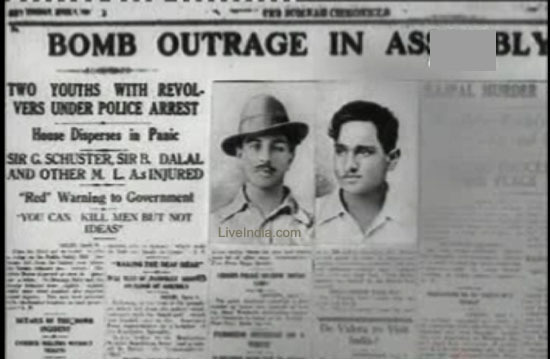 It was decided that Bhagat Singh and Batukeshwar Dutt, another revolutionary, would throw the bomb in the assembly. On April 8, 1929, Singh and Dutt threw a bomb onto the corridors of the assembly and shouted "Inquilab Zindabad!" ("Long Live the Revolution!"). This was followed by a shower of leaflets stating that it takes a loud voice to make the deaf hear. The bomb neither killed nor injured anyone; Singh and Dutt claimed that this was deliberate on their part, a claim substantiated both by British forensics investigators who found that the bomb was not powerful enough to cause injury, and by the fact that the bomb was thrown away from people. Singh and Dutt gave themselves up for arrest after the bomb. He and Dutt were sentenced to 'Transportation for Life' for the bombing on June 12, 1929. Bhagat Singh was known for his appreciation of martyrdom. His mentor as a young boy was Kartar Singh Sarabha. Singh is himself considered a martyr for acting to avenge the death of Lala Lajpat Rai, also considered a martyr. In the leaflet he threw in the Central Assembly on 9th April 1929, he stated that It is easy to kill individuals but you cannot kill the ideas. Great empires crumbled while the ideas survived. After engaging in studies on the Russian Revolution, he wanted to die so that his death would inspire the youth of India to unite and fight the British Empire.